It has been that kind of weekend. The weather was gorgeous, so cooking outside felt best. 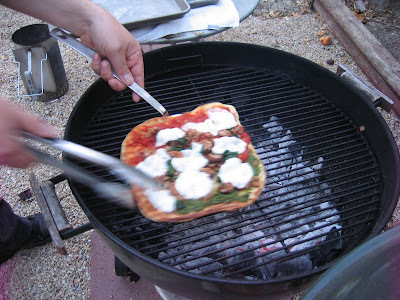 Tonight we decided to grill pizzas for a change of pace, loosely following Heidi Swanson's Grilled Pizza recipe. 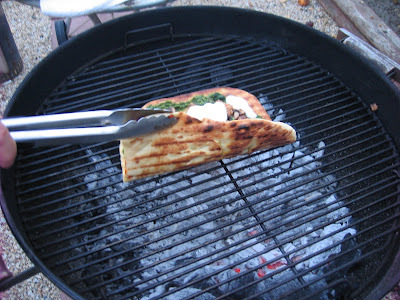 We've grilled pizza before, following the Cook's Illustrated technique the last few times. Regardless of who's method you follow, it is a fast-paced, slightly tricky endeavor. 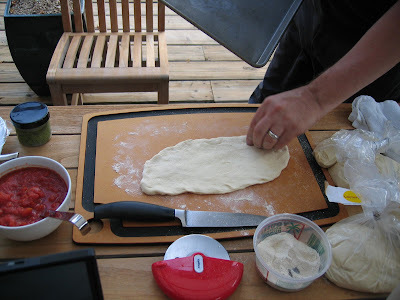 You start by shaping the dough as you would for a pizza cooked in an oven. 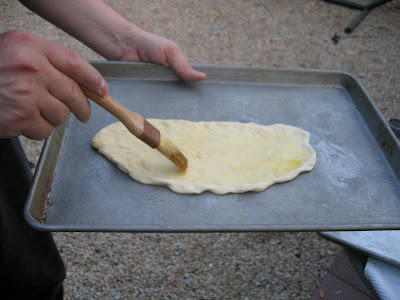 Then you brush the dough with olive oil and place the oiled side on a hot grill. Cover the grill and let the dough cook for 2-3 minutes, checking frequently. 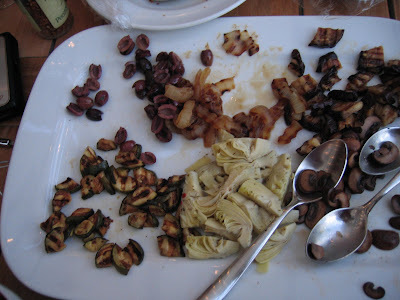 When the crust is done to your liking, take the crust off the grill, placing the raw side up. Brush again with olive oil and flip onto a flat surface (freshly oiled side down). 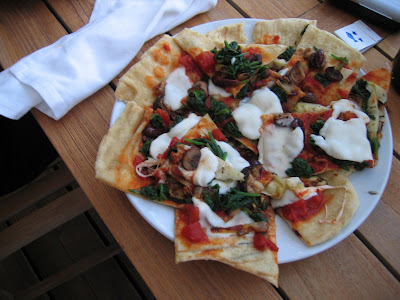 Dress the pizza to your tastes and return to the grill. 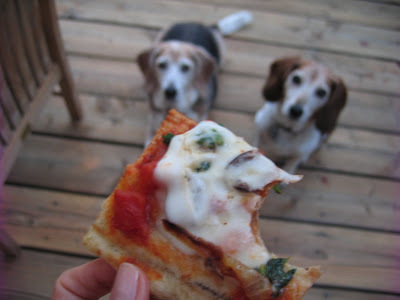 Grilled pizzas are incredible, though vastly different than the run-of-the-mill delivery variety. Thickness of the dough when it goes on the grill makes a difference. First, remember it's bread and will rise as it cooks. Thick dough makes for thicker crust. Second, consistency of thickness makes cooking easier. If its thin in the middle and thick on the edges, you run the risk of a perfectly crisp center and uncooked edges. Consistently thin dough works best. Juicy ingredients, like the sauteed spinach and pineapple we had on hand, can make for soggy pizza. Drain everything well. Putting the lid on the grill is a big deal. You want heat all around the pizza to ensure the crust cooks through and the cheese melts. 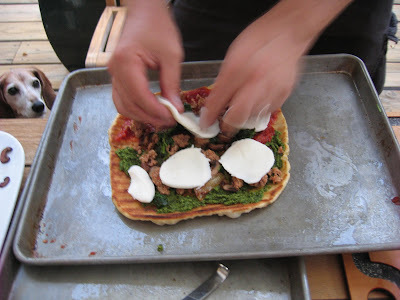 Grilling pizza takes practice to master, but it is fun and well worth the effort. 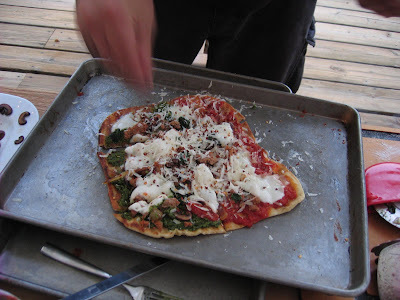 Plan to have extra dough and extra toppings so you can make a few practice pizzas while you get the hang of it. 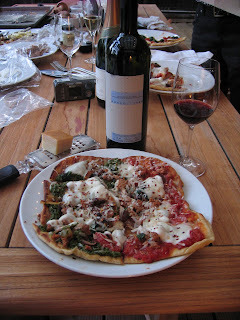 While it might seem like a minimalist menu, all you really need for this meal is the pizza and the beverages of your choice.